Spider Rock where Spider Woman lives. That’s the military carrier we rode around in for 8 hours. Bumpy but great. 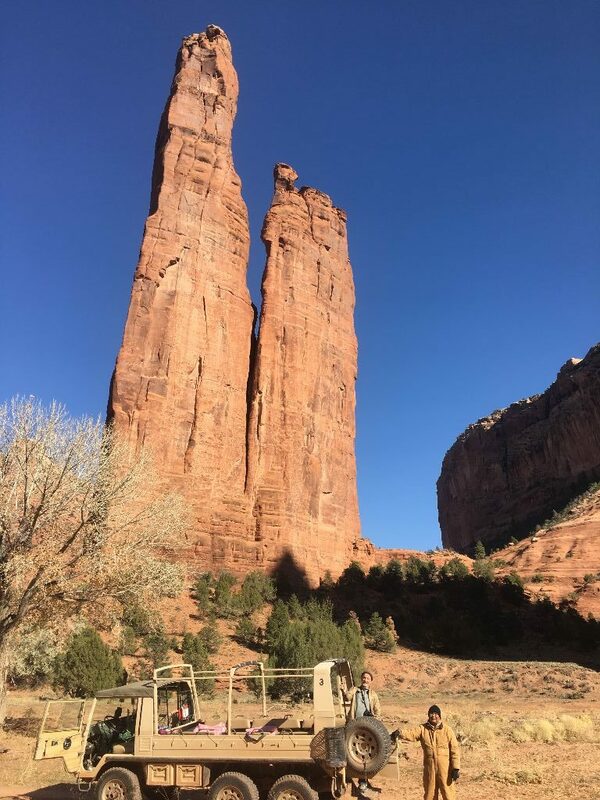 The home of Spider Woman is a small, ancient stone structure at the base of Spider Rock in Canyon de Chelley in NE Arizona. According to Navajo tradition she was first to weave the web of the universe. She taught the Din’eh (Navajo) how to weave and thus to create beauty in their own lives and to spread the “Beauty Way”. The teaching of balance within the mind, body, & soul. This petroglyph of men on horseback represents Hispanic priests. Eight hours riding around in an Austrian open air military transport carrier bumping and jostling in the wind and sun was challenging but SO worth it. The wind was chilly but not overwhelmingly so. We saw many petroglyphs and stone dwellings, amazing rock formations and colors. The Navajo history within the canyon is tragic. Kit Carson ran them out and burned their houses and peach trees. Many were murdered. if you’d like to learn more about that complex time, I recommend Blood and Thunder by Hampton Sides. But the Din’eh are back in their cherished ancestral home and have been for many years. 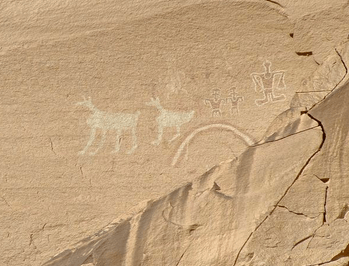 Canyon cliffs, and soaring color… a connection to the ancient… mysterious petroglyphs. These are things that feed my soul.